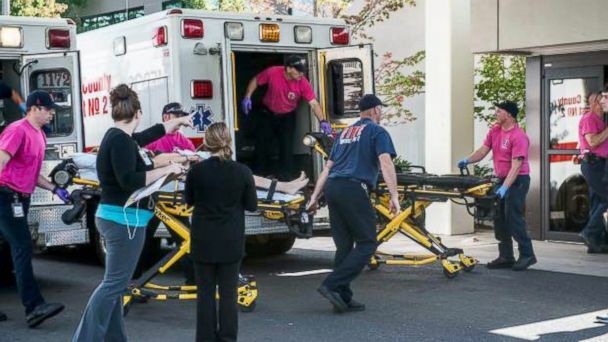 At least 13 people have been killed in a shooting rampage at Umpqua Community College in Roseburg, Oregon. The 20-year-old gunman was killed by police after the shooting broke out about 10:30 local time at the rural community college campus, officials said. Oregon State Attorney General Ellen Rosenblum said that at least 20 people were wounded. The 3,000-student school is located in Roseburg, a rural area about 175 miles south of Portland. Douglas County Sheriff John Hanlin said police exchanged shots with a male gunman in a classroom in the college’s Snyder Hall building. Sheriff John Hanlin said more 100 police officers have responded to the shooting. A White House official said President Barack Obama was briefed on the situation and will continues to receive updates. Marilyn Kittelman, the mother of a student at the college, told CNN her son said he heard no sound from the “30 some shots”, suggesting a suppressor may have been used on the gun, despite there not being an official count of those shot yet. Sgt. Aaron Dunbar of the Roseburg Police Department told CNN the “entire college went into lockdown very quickly”. Mercy Medical Center in Roseburg wrote on Twitter that it received nine patients from the college and three more are en route. Peace Health Oregon wrote on Twitter it expects to receive three victims from the shooting. Students were transported by bus to a local fairgrounds to be reunited with their loved ones. According to Umpqua Community College’s website, the average age of students is 37, with 58% female and 42% male. Sheriff John Hanlin said the school is the only place of higher education in Douglas County and that both young people and adults seeking continuing education attend the school. A former president of the school, Joe Olson, said the school has no formal security staff, and that there was debate over whether to have armed security guards on campus last year.